A strong, credible and proactive civil society in Afghanistan is critical for the country to continue its journey toward becoming a just, democratic and prosperous nation. To date, civil society’s contribution to the development of Afghanistan is unquestionable. Afghanistan’s key success stories, such as millions of girls going to school, more mothers surviving child birth and unprecedented freedom of expression and association, would have not been possible without civil society’s efforts. Traditionally, Civil Society Organisations (CSOs) have been engaged in the delivery of critical services ranging from building and running schools to provision of healthcare services and creating employment and livelihood opportunities, particularly in areas out of government reach. Today, their scope has grown. They are also engaged in influencing policy formulation and implementation, and voicing the needs and concerns of the citizens. They increasingly advocate for inclusion of women and minorities in the peace process to ensure the hard-earned achievements of the past decade are not compromised; they hold the government accountable for their actions and pledges; and they call for a transparent, free and fair election, among many other initiatives. Afghan CSOs are becoming more relevant and vocal, but to become even more viable and effective they will have to be clear about their vision, and the road ahead. And just as importantly they should acknowledge the challenges they face, some of which are self-created. Afghan CSOs are criticized as being largely donor dependent; predominately urban centered; and often disconnected from their grassroots constituencies – the very reason for their existence. As a result, they are not always seen as credible and trusted organizations. To overcome these challenges, Afghan CSOs need to demonstrate excellence, integrity and impact. More specifically, they need to a) improve their engagement with their constituencies at local and national levels; b) demonstrate transparency and accountability, particularly to the public; c) deliver quality services; and d) coordinate and deliver long term, forward looking, and strategic policy engagement and advocacy. To address those challenges, Afghanistan Institute for Civil Society (AICS) was launched in February, 2015. 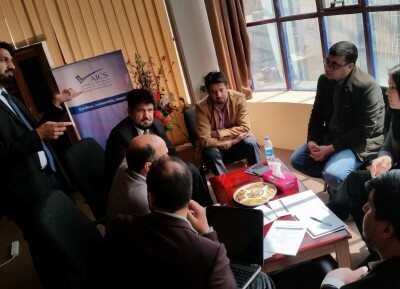 The AICS concept has been incubating for several years amongst Afghanistan’s civil society community. It saw increased traction following the 2007 Enabling Environment Conference. One of the key recommendations from the conference was to establish an independent certification body for CSOs, recognized by Government, the private sector, donor agencies and civil society. As an independent, national agency AICS strives to improve the quality and credibility of Afghan CSOs. In so doing, AICS will provide certification services in accordance with locally defined and internationally recognized standards. These certified CSOs will have to comply with culturally appropriate, locally determined and internationally recognized governance, management and operational standards. Additionally, to create a more enabling environment for Afghan CSOs, AICS will strive to harmonize and systematize the various ‘capacity building’ efforts. This is particularly important because current training and development support to Afghan CSOs is based on different donors’ requirements and approaches; they are not always aligned to the needs of the CSOs. Such disharmony impedes the creation and development of organic and sustainable skills within the CSOs, critical to their service delivery abilities. AICS will engage with CSOs, donors, and INGOs to agree on an aligned approach and minimum standards, resulting in a more needs-based, centered and harmonized capacity building for CSOs. AICS will also strive to act as a national platform for fostering cohesive relationships between CSOs, the government, donors and the broader sector. The core tenant of AICS’s policy and advocacy engagement will be the use of ‘evidence’. This will enable the CSOs to move beyond events-based reactive advocacy to more proactive and long term engagement around shared objectives. The establishment of the AICS demonstrates the commitment of CSOs, donors and Afghan government to consolidate and expand the achievements of the past decade. We hope that a more robust, self-aware and accountable civil society sector will promote pluralism, meritocracy and inclusive development in Afghanistan. At AICS we envision such an Afghanistan. In AICS we are prepared to create such an Afghanistan. The process for establishing the Institute has been facilitated by the Agha Khan Development Network, led by the Aga Khan Foundation in partnership with Counterpart International, with support from the USAID-funded Afghanistan Civic Engagement Programme. The conference was convened by the Government of the Islamic Republic of Afghanistan in collaboration with the Aga Khan Development Network, the World Bank, the United Nations Development Program and the Asia Development Bank.